Well, I've got the same writing house fantasy and I think having one would help. But I'd have to live in it, and it would have to be far away from my regular house - the point would be, not to see all the other stuff there is to worry about in the regular house. I've rented two different ones for vacations in the past year. One looked exactly like the fantasy, and one didn't; they both worked equally well, though. This was because they both had what I came to realize were key features. Here's the list. 1. Small kitchen and bathroom, so you can cook and bathe well enough but not be tempted to make fancy meals or take long baths; loft or sleeping alcove so you can sleep slightly screened from your work. 2. Work room with desk that has chair of right height. Facing it, an even wall of bookshelves, so you can see all your books in order, and in one place. To the left (the place of imagination), a window with a nice view. P.S. I think my other, more general and eccentric comment got eaten; oh well. 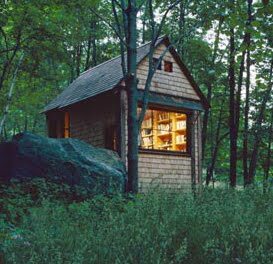 My writing house would have an internet connection and a phone. Of those I've experimented renting, both had these and it was a great help. At the time I didn't have an Internet connection to my real house, and didn't realize what an impediment it was. The phone is less important nowadays but still, having one lets me stay in and concentrate. In both writing houses I didn't have a car, but relied on public transportation; that was good, too, in terms of reduction of outside responsibilities. The big advantage of having a writing house you live in part time is that you are separated from responsibilities of bigger houses and it's *all* creative space, nothing else. Anyway, my writing house in fantasy would have the esthetic characteristics yours would, but in practice I've found these don't matter too much -- the smallness of them does, though, and the fact that they really are dedicated to writing. AHA - my other comment didn't get eaten - now I'm redundant. More: the other characteristic of a writing house is what is outside it. Where I actually live, I'm not comfortable going outside because of the weather and also the general environment. So I am restless inside my house and it's hard to concentrate. In both the writing houses I rented, I was very comfortable with what was outside them. That meant I could go out for refreshing walks and adventures at any time, that would give me new perspectives, and so on. The fact that this was possible helped me stay in and concentrate. LIGHT is also very important in writing houses. I can't afford to rent them in first world type countries, only in low rent countries, and these countries generally have weak florescent light or very low wattage. This is very bad for reading, for me anyway; I get bored and finally realize it's because it's so much effort to see. One doesn't want to ruin one's landlord by importing ecologically incorrect electric lamps or bulbs. On my list of Stuff To Take next time, therefore, are some form of battery operated lighting that will shed light in the right, bright, non harsh color. I have not yet found this product, but I am looking. Do I? Shut up. Every day. Sigh. Thanks feeding the fantasy with the links. You know those Chinese & Japanese scrolls that show huge mountains with picturesque pine trees, and either dramatic waterfalls or a tranquil lake, and down in the corner a little pavilion with a scholar working or being visited by someone? Those always make me want a little writing pavilion with a good view, even though in summer it would no doubt be hot and buggy, and in winter bitterly cold. It just looks like the sort of stripped-down place where you could get on with things without distractions. profacero, this gives me a whole new way to think about writing houses. I'd been thinking of them as a separate space, not one that I would live in, too. I always look to the left for ideas and writing, too. naptimewriting--you, too? I didn't even know that some houses advertised 'writer's cottage in yard' and now will have to look for those, too. Since I can't afford one anyway, it doesn't cost any more to locate my fantasy writing house on the side of a mountain or by a stream. tenthmedieval, that's the perfect writing house. Small, access to supplies in a nearby, non-exciting town--perfect. Dame Eleanor, I know exactly what you mean. I like the open plan, but if I had one of those, I'd spend all my time talking to the cats in the yard (as if I don't do that already). I love this post: it crystalizes a desire I didn't know I had, beyond a general longing and some free-floating jealousy whenever I'd read about some author's study. Case in point: I read an article a few years ago about Michael Chabon's writing house (I tried to find it to link, but no luck) and it made me hate him a little bit more (although I love his novels). AHA, someone else who looks to the left for ideas and writing, yay! 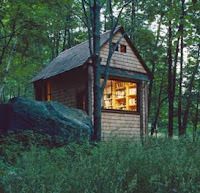 I am trying to convince a friend to install a writing house in her backyard. She got married and her husband moved in with all his stuff, so the house is stuffed. After all, lots of people put art studios in their backyards, so why not a writing house? And Garcia Marquez wrote 100 Years of Solitude in the garage apartment of their house -- hid himself in there for 18 months straight, emerging rarely, I hear. There's a Peruvian writer I know who has to go and rent something out of town to write, too many distractions in the office and at home. He gets a lot done, too. And there's a winsome cottage near me being offered for sale as a writing house.